Bungalow Gratitud (Spanish for Gratitude) was the very first structure of the Bodhi Surf + Yoga lodge, finished in 2013. As such, Bungalow Gratitud (or the Bodhi Bungalow as it was first known) represents the beginning of our vision and has been instrumental in providing many guests with unforgettable experiences, and affording us many new friends and the ability to continue building our dream. For this we feel very grateful, and have rightly named it so. Gratitud is the perfect place for a family or group to repose during their fun-filled week of surfing, yoga, and adventure. While we may not have what some may consider to be necessities (air conditioning, television, or microwave), the intention of the Bodhi lodge is to promote comfort, simplicity, sustainability, and harmony — with nature and between guests. Bungalow Gratitud is the largest of our accommodation options, housing up to four adults and one child. It is ideal for groups of three to four adults participating in the Bodhi Sessions surf and yoga camp, or for families with children joining the Bodhi Family surf camp. 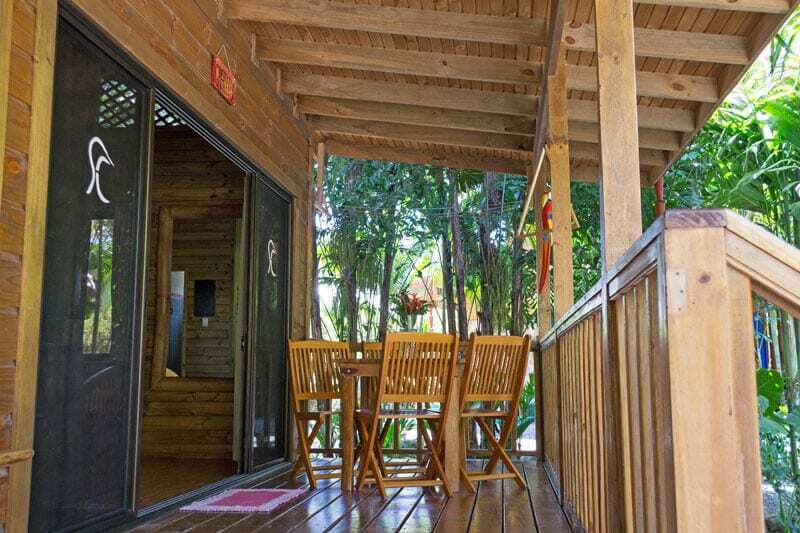 It is a raised wooden stand-alone bungalow with a spacious deck surrounded by lush plants, a kitchenette, a private bathroom, a master bedroom, a studio-style room, and a large open space that can serve as another sleeping area or a living/dining room. It has large windows for maximum light and airflow, and both ceiling and standing fans. For sleeping arrangements, the bungalow has one Queen size bed, two singles that can be joined to form a King size bed, and a daybed that can also serve as a regular bed for a child. The bungalow has a fully equipped kitchenette with all the necessary kitchen tools for you to prepare your own meals, hot water, and Wi-Fi. The bed was better than the one I have at home. The bungalow was so much better than anything else we came across the entire trip.